About 100 people have made allegations of abuse at a former children's home in Jersey, which they say happened between the early 1960s and 1986. In 2006 Jersey police began a covert investigation at Haute de la Garenne, and the ongoing inquiry has also discovered the partial remains of young children. Here are the main developments. Police started digging at the site in February 2008. 26 September 2008: Jersey's Chief Minister, Frank Walker, tells British and Irish politicians there is no rift with the judiciary, following criticism by Jersey Police's former Deputy Chief Officer Lenny Harper. 16 September 2008: Jersey's Attorney General, William Bailhache, defends the island's legal system, following allegations of a "cover-up". 28 August 2008: A memo from Lenny Harper leaked to the BBC says the investigation team has been "let down" by lawyers assigned to assist them. 26 August 2008: Attorney General William Bailhache decides there is "insufficient evidence" to bring a prosecution in one of six cases related to the inquiry. A man and a woman arrested on 24 June are released without charge. 15 August 2008: A campaign group set up by Lib Dem MP John Hemming and Jersey senator Stuart Syvret launches a High Court bid for a judicial review of what it calls the "failure" of UK ministers to "enforce the rule of law" over the inquiry. 7 August 2008: Lenny Harper, who led the two-year Jersey Police investigation, retires. He is replaced as Deputy Chief Officer by David Warcup. 5 August 2008: Gordon Claude Wateridge, 77, is charged with with 16 counts of indecent assault relating to alleged offences against four girls and one boy in the 1970s at Haut de la Garenne, where he was a former warder. 1 August 2008: Attorney General William Bailhache says he is confident Jersey's judicial system can deliver justice in the alleged cases of historical child abuse. 31 July 2008: Police say remains of at least five children aged between four and 11 have been found, but a murder inquiry is unlikely because they cannot be precisely dated. Searches of the home have uncovered 65 milk teeth and more than 100 bone fragments. 22 July 2008: Labour MP Austin Mitchell tables a Commons motion calling on the UK government to hold an inquiry into the child abuse allegations. He says he has no confidence in a public inquiry by Jersey's authorities. 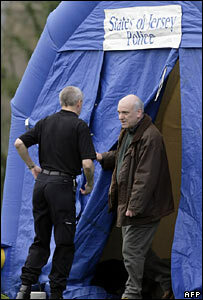 14 July 2008: Police say material found in the search of the WWII bunker corroborates claims made by witnesses. 8 July 2008: Police are to start searching a World War II bunker as part of their inquiry. Six people claim they were abused at the site, which is 500 metres away from the home. 19 June 2008: The number of milk teeth unearthed at the home rises to 48. 4 June 2008: Attorney General William Bailhache says a judge from outside the island could be brought in for trials resulting from claims of historic child abuse. He told the Times this could happen if several people pleaded not guilty and long trials were likely. 31 May 2008: Michael Aubin, 45, is charged with sexually abusing three boys at Haut de la Garenne between 1977 and 1980. 29 May 2008: Police say tests on five teeth found in a cellar revealed most probably came out after death and were from at least two children. 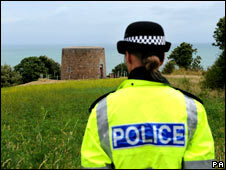 21 May 2008: Jersey police say bone fragments found in the cellar "do indicate a homicide or an unexplained death". There is also evidence fragments had been burnt in a fireplace. The list of suspects grows from 40 to 70. 18 May 2008: Jersey police confirm that what they originally thought were bone fragments discovered on 23 February are more likely wood or even coconut shell. Police say they had already discounted the discovery since it likely dates from before the 1940s. Their investigation continues. 30 April 2008: Claude Donnelly, 68, appears in court charged with sexually assaulting a 12-year-old girl. The offence is not related to the Haute de la Garenne investigation, but is part of a wider inquiry into child abuse. 9 March 2008: A rally takes place in St Helier highlighting public concerns about the way claims of abuse at Haut de la Garenne have been handled by the Jersey authorities. 7 March 2008: A sniffer dog is reported to have detected traces of blood in a concrete bath inside one of the bricked-up cellars. 28 February 2008: Police say they have made "significant" finds in the cellar - understood to be a set of shackles and a shallow concrete bath. 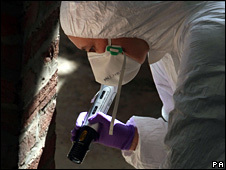 25 February 2008: Police focus their attentions on a bricked-up cellar after a sniffer dog helped them identify six "sites of interest" for investigation at the former home. 23 February 2008: Police say they believe they have found "what appears to be potential remains of a child" under several inches of concrete in a stairwell in the north-west corner at the back of the building. 19 February 2008: Jersey police, acting on information from their investigation, begin an exploratory search of the former care home at Haut de la Garenne. 30 January 2008: Gordon Claude Wateridge is charged with three offences of indecent assault on girls under 16 between 1969 and 1979 at Haut de la Garenne. 11 September 2007: Stuart Syvret is removed from his post after losing a vote of no confidence. 22 August 2007: The States agree to an independent review of child protection arrangements in Jersey. July 2007: Health Minister Stuart Syvret accuses the States of failing to protect children in another island home. 2006: Jersey Police begin a covert investigation into abuse of children at Haute de la Garenne following allegations by former residents.